"How strange or odd some'er I bear myself, as I perchance hereafter shall think meet. To put an antic disposition on!" 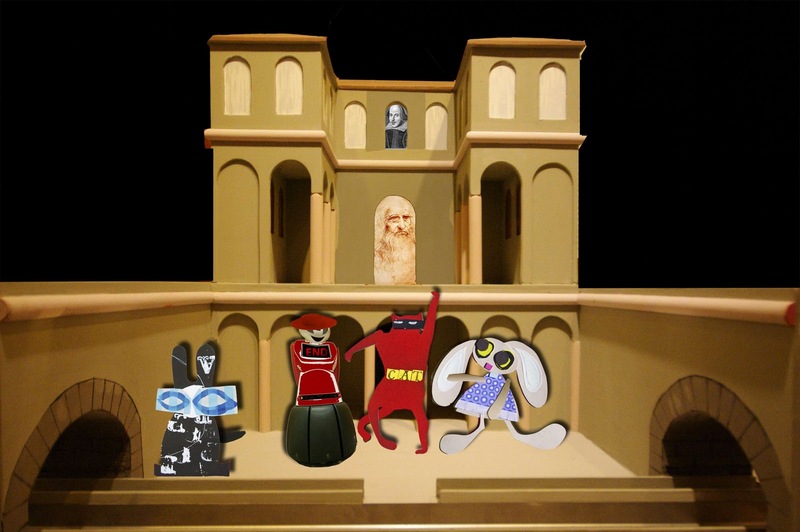 said the Wabbit sighing with relief to be at the end of his play. "I thought his lines were most trippingly spoken, the most antic of us all," said Lapinette pointing at Skratch. Skratch waved at the audience and smiled a broad grin. "When words are scarce they're hardly spent in vain and even though a cat, I had my day" said Skratch. "And I could smile and smile and be a villain," droned Robot. "But what occurs?" said the Wabbit. "The page is female, not a boy. She wore her gender in the fashion of a hat and all were fooled." "I was not fooled," said Robot, "but didst play along for fun and interest." "And now we must strip off the motley which we donned in jest and to our offstage lives return," said the Wabbit. "Doubtless, thou meanest to a hostelry repair for sustenance and aperitivi?" asked Lapinette. "I certainty doest," said the Wabbit. "Then let us not stand on the order of our going and proceed forthwith," said Skratch. So they all bowed low to the audience several times and exited the stage to much applause - and there were no catcalls whatsoever.